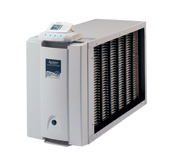 The Aprilaire Air Cleaner is never less than 94% efficient at removing disease-causing bacteria as small as 0.35 micron. No other whole-house air cleaner can reach more than 70% efficiency in trapping these tiny particles. Do you suffer from allergies? Often catch colds in the winter? Many of these may be caused by airborne contaminants such as cigarette smoke, pollen, bacteria, viruses, mold and dust. This Electronic Air Cleaner will provide you with much needed relief. Outside Dimensions: Housing is 17 3/4" x 28 1-8" x 11 1/2", overall length with power pack/door assembly is 17 3/4" x 31 1/8" x 11 1/2"
Inlet Opening: 14 3/4" x 23 7/8"
Outlet Opening: 14 3/4" x 24 7/8"